One like that in red and one in black. I use these when I travel. I can fit the entire planet in them and not worry about them. I've had them for years and schlepped them all over the world - they hold up great. Here's the thing. I don't like to have to carry a purse anymore. This need to lighten the load of my life has extended to my accessories now. I might get rid of them all, except those two travel bags. I would be lost without those on an airplane. That's it. My credit/debit cards and driver's license under some sanitizing gel (estate sales can be dirty business), altoids and my jewelers loupe. A hair clip, pen, MAC lipstick, lip balm, spare change and one single dollar (how sad is that?). I should have some business cards and my little notebook in there as well, they might be in the outside pocket but that's it. I'm finding, this is really all I need to get it done. What have you been carrying around with you that you could live without? That could be a very deep question but I'm mostly talking about purses here. I love that you have paired it down to that. I really need to do that. I have a few makeup essentials, my phone, iPod, wallet (which needs to be streamlined), note book and pen that should always be with me. Somehow though, my purse is always filled with other stuff. I think I need to downgrade to something smaller to streamline. My estate sale bag is gigantic . a canvas number that I got at a g sale for a dollar. If I had a dollar for every time someone asked me where I got it I'd have a lot of $$. It's from old navy. It looks military prob about 30 by 30. I carry reading glasses cash lips loupe gum .. Then I use it to throw in smalls at sales. Hmmm...you know what size my winter bag is, too big! My wallet wouldn't even fit in that little suede purse! Must downsize purse, must downsize purse, must down...ho hum where was I? I, like my mom, rarely have a lot in my purse. After moving so many times in recent years, I find I want less and less stuff. What do I carry with me that I could live without? Guilt... that nagging feeling that one is never doing enough to meet everyone's needs. On a lighter note, I often forget to remove the Olympic cowbell from my purse following my boys' hockey games. Nothing like 'jingling' through the grocery store! I love that you have a loupe in your essentials! For me it's a small cm folding measure! I never carry much in my purse, just about what you have. I have a bag just about the same size crosses in the front. When walking with canes it is much easier. I even have a small really sturdy, flat rectangle wallet (la tarjey) that only carries the basics. I have small bag of meds I always have to carry on me, cough drops instead of Altoids, hand wipes instead of sanitizing gel and a small camera. Love, love, love the red bag ! Ooh! You DO have cute purses! And great taste! Wait a minute... Who schlepped the big red bag all over the world??? That would be me. "Big Red" always found its way to my hand on those trips. So true. I should have said it was my husband's purse for travel, would have been more accurate! As for the pared down version - very nice. 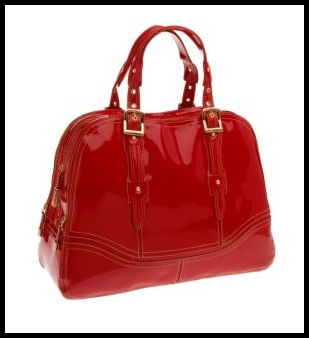 I'm not one for the big handbag and find that like other areas of life it can be an attracter of 'stuff'. Some days I don't even take a bag with me, mind you they'd be the days when I have a pocket for my car keys....my credit card slipping into my bra! I go there as well Felicity only I slip my cell phone in my bra! You are just like me! I love a cross-body bag to keep me hands-free for shopping. I've never been a fan of lugging around a big bag. Just a small wallet, phone, sunglasses, a nylon reusable foldable shopping bag and small things like bandaids, a wet wipe, exedrin and a kleenex and I'm good to go!